The book’s remaining chapters are concerned with settings in which someone has harmed, or is about to harm, another. Because the Constitution isn’t entirely successful in taming state power, there are many occasions when state activity undermines justice and yet is not subject to judicial oversight. 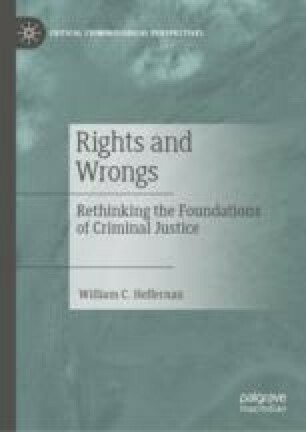 This chapter examines two settings in which the police have not been adequately restrained by constitutional rules. One is concerned with stop and frisk. It’s arguable that the rules governing stop and frisk are tilted excessively toward state power. Whatever the merits of this claim, an even graver concern has to be confronted, for it’s patently clear that no constitutional rules exist regulating the frequency with which police forces rely on stop and frisk. This frequency issue must be addressed, the chapter argues, for otherwise police can use their power—constitutionally legitimate power—to dominate minority communities. The other concern has to do with police surveillance of behavior in public places. This issue is also not subject to any constitutional restraint. Even if the Fourth Amendment is never interpreted to impose a limitation on the police in this context, it’s essential, the chapter contends, for government officials to acknowledge one. Otherwise, public places can be converted into giant television sets for tracking citizen behavior.